Atlases of the United States / New York / An atlas of the state of New York : containing a map of the state and of the several counties / by David H. Burr. "Published by the Surveyor General, pursuant to an Act of the Legislature. Stone & Clark, republishers, Ithaca, N.Y. 1840." Note 2.) Prime meridian: Washington, D.C. Note 3.) Shows flouring mills, factories, forges, saw mills, churches, parcels, and landowners. Note 4.) "Entered according to Act of Congress Jany 5th. 1829 by David H. Burr of the state of New York." Note 5.) "Entered according to Act of Congress Jany 5th. 1829 by David H. Burr of the state of New York." Note 6.) "Entered according to Act of Congress Jany 5th. 1829 by David H. Burr of the state of New York." Note 7.) "Entered according to Act of Congress Jany 5th. 1829 by David H. Burr of the state of New York." : Atlases of the United States / New York / An atlas of the state of New York : containing a map of the state and of the several counties / by David H. Burr. 1 atlas (40,  leaves : col. maps (some folded) ; 58 cm. SSPL framed map: 22.5 ''x 28'' 1 map : hand col. ; 45 x 30 cm. Burr, David H., 1803-1875 -- Cartographer Rawdon, Clark & Co. -- Engraver Rawdon, Wright & Co. -- Engraver, “Map of the county of Saratoga / by David H. Burr ; engd. 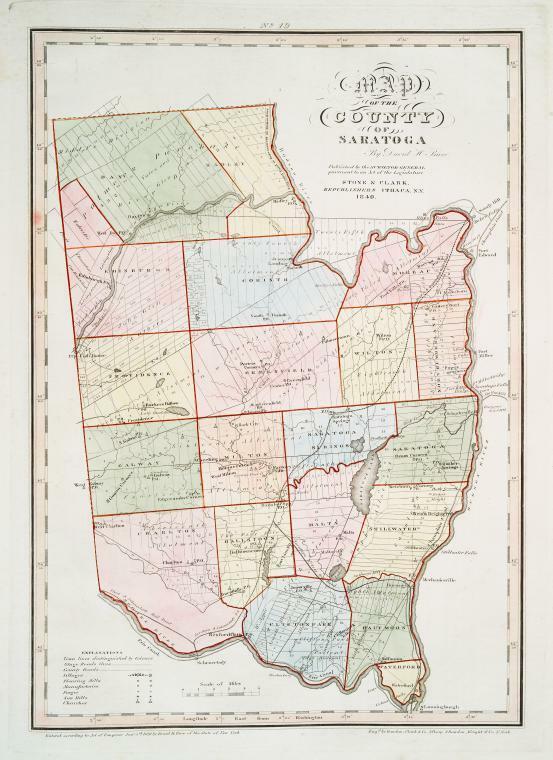 by Rawdon, Clark & Co., Albany, & Rawdon, Wright & Co., N. York.,” Skidmore Saratoga Memory Project, accessed April 24, 2019, http://ssmp.skidmore.edu/document/189.